An editorial titled "A Free Press Needs You" is published in The New York Times, Aug. 16, 2018, in New York. A generation ago, the likes of Walter Cronkite, Peter Jennings and Diane Sawyer were the heroes of television news. Now the biggest stars are arguably Sean Hannity and Rachel Maddow. 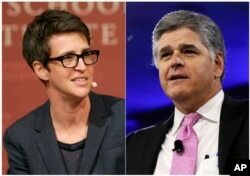 FILE - This combination photo shows MSNBC television anchor Rachel Maddow, host of "The Rachel Maddow Show," left, and Sean Hannity of Fox News. Let's not neglect the memorable journalism that the Trump era has produced all across the country. Many newspapers are far from “failing,” as Trump often claims about the scoop-hungry shops at The New York Times and The Washington Post. The number of digital subscribers to the Times has jumped from below 1 million in 2015 to more than 2.4 million now. For many years, those network executives did a delicate dance. The stations were news during the day, opinion at night. But with the opinion shows so successful - shouting what you believe tends to “pop” more than facts - it has become harder to suppress those identities. Even when different sides are given, the hours are filled with opinionated people giving their takes. When press secretary Sarah Sanders rebuffed CNN reporter Jim Acosta's attempt to have her renounce Trump's attacks on the press, she noted that she's been attacked personally by “the media” more than once, including by CNN. FILE - People line up outside of the Washington Post newspaper to purchase special election editions in Washington, Nov. 5, 2008. “I don't blame the public for being confused,” said Kathleen Hall Jamieson, communications professor and director of the Annenberg Public Policy Center at the University of Pennsylvania. In a heated news environment, journalists are left to find descriptions for things they haven't seen before. CNN's Anderson Cooper called Trump's performance in a joint news conference with Russia's Vladimir Putin “disgraceful” after both leaders left a Helsinki stage this summer. For Cooper, it was a moment of truth-telling. For the president's supporters, it was a brash embrace of bias. The survey suggested that people are in different realities. For instance, 63 percent of Republicans correctly said the statement “Barack Obama was born in the United States” was a fact. Meanwhile, 37 percent of Democrats incorrectly identified the statement “increasing the federal minimum wage to $15 an hour is essential for the health of the U.S. economy” as fact, not opinion. One Facebook feed, for example, linked to a Los Angeles Times article with the headline, “In a strikingly ignorant tweet, Trump gets almost everything about California wildfires wrong” and gave no indication that it was an opinion piece. “After they laugh, they talk about some person spouting off on Fox or something,” he says.